The high quality promotional products offered by ITATI® are a powerful tool to effectively communicate with your clients. Do promotions through ITATI® products allow you to consolidate the values ​​of your brand/product. ITATI® is communication. Communication of quality, creativity and professionalism. Printed entirely and completely customizable, ITATI® promotional products have a huge visual impact. Thanks to the high resistance and fastness to washing, the ITATI® promotional products have high duration in time. 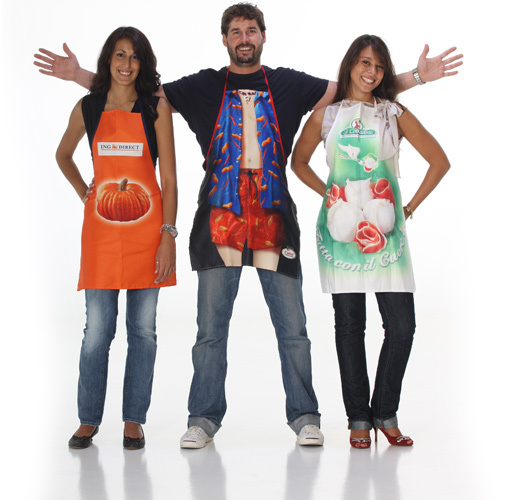 That lowers the cost-per-contact: more people and for a long period may be catched by your ITATI® promotional product. On request ITATI® realizes tourism products for specific locations. Why CHOOSE ITATI? To communicate entirely with the end consumer! Your brand and your product will be associated with an image of high quality and creativity and, thanks to high guarantee durability over time, your image will catch a wide audience of consumers. This is a power that a traditional and "poor/cheap" promotional product doesn’t have: communicating with a promotional product "poor" is equivalent to non-communicating or communicating what you would not like. This is a good reason to choose ITATI®. In the language of marketing and corporate communications, promotion is the incentive or stimulus that tends to know and appreciate a product or an idea. To promote something you need for effective communication techniques, following the famous model proposed by Shannon and Weaver, based on stimulus-response-feedback relationship. Stimulus-response and feedback with ITATI® products are guaranteed! According to the theories of micromarketing, a high quality promotional product has statistically four times grip on the consumer, allowing retention of existing customers and the acquisition of a new range of customers. The promotional communication process in marketing of a company, is divided into several phases. ITATI® aims to offer its customers a complete set of essential services for good corporate communication, following them step by step in the realization: from choosing the product best suited to requirements, from creatively concept the brand image, to graphics creation. In 72 hours ITATI® is able to provide samples to be proposed to the customer, who can assess not only "on paper" the end result of the promotion. The ITATI® promotional products are conceived, designed and manufactured entirely in Italy. WANT TO DISTRIBUTE ITATI® PRODUCTS? Our enthusiasm and the great success obtained in the world with ITATI® collections, stimulate us to increase our distribution network to make it more diffused and cover areas or sectors currently discovered. If you want to join our family by becoming our distributors, ITATI® will make available its entire range of products and could manufacture special products created specifically for you, supporting you in the implementation of graphical ideas for new gadgets and giving you the opportunity to meet more the interest of your customers.